This page compares the use of commercial pH strips against a calibrated pH meter. The data were collected on 16th October, 7th November, 13th November and 10th December 2011 on various ciders and juices which I was pressing in the 2011 season. Merck (branded BDH) strips aka 'Colorphast'. Catalogue 31501. These strips probably > 10 years old. Opaque plastic bonded strips - methyl orange is the likely indicator. Colour comparison printed on box (red to orange) for pH values 2.5, 3.0, 3.3, 3.6, 3.9, 4.2, 4.5 (3.3 and 3.6 almost identical) Viewed outdoors in cloudy-midday conditions. Vinoferm strips. Catalogue 013.073.2 Freshly purchased. Translucent paper strips - bromophenol blue is the probable indicator. Colour comparison printed on strips (yellow to purple) for pH values 2.8, 3.1, 3.4, 3.6, 3.8, 4.0, 4.3, 4.6 Viewed outdoors in cloudy midday conditions via transmitted and reflected light. Lyphan strips. Catalogue L 656-8. These strips probably ca 8 years old. Translucent paper strips - bromophenol blue is the probable indicator. Colour comparison printed on strips (yellow to purple) for pH values 3.0, 3.2, 3.4, 3.6, 3.8, 4.0, 4.2, 4.4 Viewed outdoors in cloudy midday conditions via transmitted and reflected light. All strip values were interpolated where required, if falling between 2 calibration points. Hanna pHep5 HI-98128 dipstick pH meter calibrated at pH 4.01. Quoted resolution ± 0.01 pH. Quoted accuracy ± 0.05 pH. The graph plots 20 data points covering a typical pH range for UK cider apples. The data show that the Merck strips seem to read higher than the pH meter over much of their range, while the Vinoferm strips typically read lower. 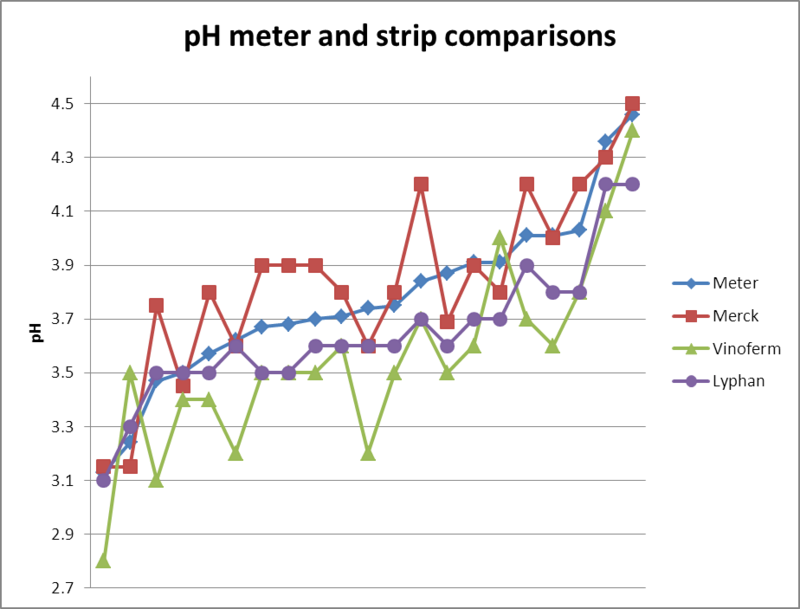 The Lyphan strips seem to track the pH meter reading best, but even so are typically lower. The Vinoferm indicator bar is poorly laid down on the paper and gives a blotchy appearance when in use, rather than a continuous colour. Lyphan is better in that respect. It is quite hard to read both Lyphan and Vinoferm strips - in the middle part of their range the indicator bar does not seem to correspond well in hue with the printed reference strips, effectively being shades of grey. This is more noticeable on the Vinoferm strips. I was also concerned that the Lyphan and Vinoferm strips do not respond correctly to the pH 4 standard buffer used to calibrate the pH meter, both coming in nearer to pH 3.8 than pH 4 (but still in shades of poorly-matching grey). The Merck strips by contrast give the correct reading with the pH 4 buffer. (That data point is not shown on the graph because it is not juice nor cider, which is the topic of interest). SD 0.18 is RMS error once readings are corrected by the bias value - this is more reasonable, but still the highest. Lyphan, same RMS error as Merck, but with a larger bias. So this one is more easily corrected: one should add 0.13 to the strip reading to get a more accurate pH value. The SD indicates that the RMS error would then become 0.09 - less than 0.1 unit of pH, which would be quite good. I would prefer to buy Lyphan strips, but Merck comes close... Vinoferm is definitely the least accurate. 1. The inherent limits of the physics and chemistry. Acid/base indicators are complex organic dyes which change colour due to changes in electron orbital energy levels depending on whether they are protonated or not. At either end of the range the changes are easy to spot e.g. bromophenol blue goes from yellow when fully protonated at pH < 3 to blue at pH > 4.5 when it is not. But the intermediate hues of partial protonation are effectively shades of grey and so it is very difficult to assign a specific pH to each intermediate shade with any accuracy. I suspect (but I do not know) that this might alter depending on what else is in the solution too and probably affects the exact way in which the dye is ionising. 2. The printing process or the QC around the reference colours. These are presumably printed on the strips as normal permanent (and pH independent) dyes. The care with which these are selected and QC checked batch to batch probably varies. I expect a branded lab quality strip will be better in this regard than just something slung together that's "good enough for home winemakers". I think the data and Claude's analysis bears this out. Claude has suggested a correction offset figure for the strips but I wonder if this would be consistent from batch to batch if the manufacturing tolerances are poor. If you can afford to buy and care for a pH meter then do that, bearing in mind that a meter is more costly, needs care in use and storage, and must be calibrated for every session. But even a bottom of the range dipstick-type branded meter from a reputable manufacturer (eg Hanna UK or Hanna USA) will nowadays offer an accuracy of ± 0.1 pH units and may have replaceable or renewable electrodes. You also need calibration buffer (pH 4 at minimum), cleaning and storage solutions if it is to serve you well. If you can get hold of good quality branded lab pH strips then they are passable substitutes but with poorer accuracy . The cheapo hobby winemaking pH strips are less good but probably any measurement is a good deal better than nothing at all! Even a rough idea of pH will still be helpful in deciding the level of SO2 to add, which is also subject to many approximations in itself!